The story of the Ideas Box begins in 2010. Our team was building libraries in Haiti when a devastating 7.0 earthquake hit the island. We prepared to leave so that humanitarian aid and reconstruction efforts could begin. However, our local partners asked us to stay and help them create information and cultural access points in the settlement camps where tens of thousands of Haitians were forced to live in the aftermath of disaster. While we respected our local partners’ wishes, we wondered if this was the right time to build libraries and other learning spaces; not everyone had food, water, or shelter — did they really need books and internet? At the insistence of our partners, we began working in camps for internally displaced persons (IDP). It was in these places where we witnessed firsthand the importance of information and cultural tools in disaster relief efforts, particularly in the lives of children. Our team on-the-ground watched the books they provided help children heal from trauma, counter the boredom of being without school or structured activities, and develop resilience. 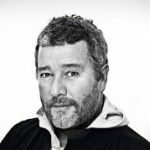 This experience compelled us to collaborate with the French designer Philippe Starck and the UNHCR to create a pop-up multimedia center and portable library that could withstand the most difficult circumstances: the Ideas Box. The Ideas Box is an innovative tool that expands access to information, education and cultural resources to places that desperately need them — refugee and IDP camps, rural and isolated communities, and underserved urban spaces or indigenous communities around the world. The Ideas Box is highly-durable, easy to set-up and energy-independent. 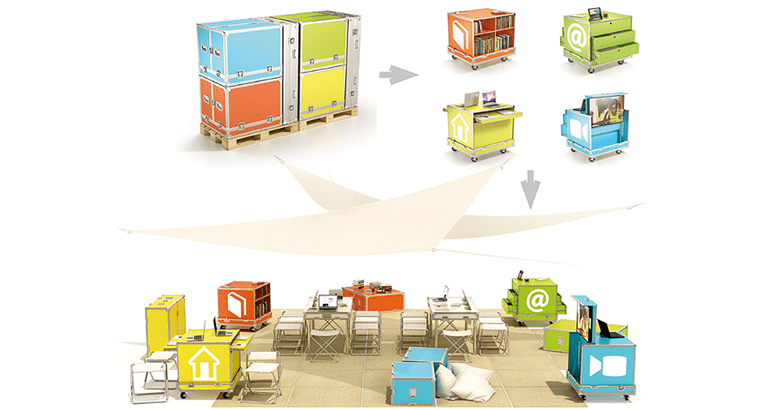 Within twenty minutes of unloading the box, users will have access to a satellite internet connection, digital server, a power generator, 25 tablets and laptops, 6 HD cameras, 1 large HD screen, board games, arts and crafts materials, hardcover and paperback books, and a stage for music and theatre. Our expert team also ensures that each Ideas Box is customized to meet local needs by collaborating with organizations, leaders and members within the community. After a natural disaster or during a political conflict, humanitarian aid naturally focuses on providing food, health care, shelter, and clothing. Once these basic needs have been met, we believe that it is essential for affected communities to connect to worlds of information and knowledge in order to fight ignorance and boredom and to build resilience for a more self-reliant future inside and outside the camps. By providing access to the Internet, books, cinema, theatre and educationnal resources, the Ideas Box provides children and communities the tools to cope with boredom and trauma and to create their own solutions to the challenges they face. We also believe that culture is a formidable force for promoting peace and reconciliation. Access to information, education, and culture are critical in conditions of post-conflict and transitional justice to promote healing and build more tolerant communities. As Colombia moved toward peace with Latin America’s longest standing revolutionary group, the FARC, the Colombian Ministry of Culture reached out to LWB to support the implementation of mobile libraries in areas where demobilized fighters would live. The Middle East is a critical response zone for Libraries Without Borders, which has implemented four Ideas Box projects in Jordan, Lebanon and Iraq, and is preparing a dozen more. We implement projects in both refugee camps and host communities. Our programs in the Middle East are built in accordance with regional humanitarian response plans, with a particular focus on issues related to education, child protection, and capacity-building of refugee populations. As Colombia moved toward peace with Latin America’s longest standing revolutionary group, the FARC, the Colombian Ministry of Culture reached out to LWB to support the implementation of mobile libraries in areas where demobilized fighters would live. Despite the failure of the popular peace referendum in 2016, LWB continues to work in Colombia with the Ministry of Culture and the Colombian National Library. In 2017, LWB implemented 20 Ideas Box projects in demobilization zones throughout the country in an effort to leverage cultural tools to promote peace, reconciliation, and tolerance in the Colombian peace-building process. We began our first Ideas Box program with one Ideas Box in Burundi in early 2014, and now we have four inside and outside the camps. These Ideas Boxes attract thousands of people every week and have since become landmarks and community centers. With political conflict spreading in the region, LWB has broadened its work to include Rwanda, Tanzania, and especially Kenya, where we will open a program in 2017. Libraries Without Borders also provides support to the millions of refugees that have been arriving in Europe since 2012, with over 1.3 million in 2015 alone. In a pilot project, LWB launched three Ideas Box projects in Greece (Lesbos and Athens), one in Germany (Düsseldorf), and three in France (Paris and the Grande-Synthe camp). Initially, we designed these projects to have rapid impact, support refugees in transit, provide legal assistance, and help refugees locate family members. The Ideas Box projects quickly became safe spaces, which our local partners asked that we convert into reception and integration areas focused on education, child protection, and the empowerment of refugee communities. In France, the United States, and across the world, large segments of the population, including rural communities, are marginalized and lack access to cultural resources and quality educational programs. Through our efforts to create library spaces and free public educational resources, LWB fights against inequality, discrimination, and the dangers of misinformation. Our collaboration with libraries in France, Australia, and the United States demonstrates the tremendous effect and potential of tools like the Ideas Box to transform communities, and to reinvent the library itself. Since the need to reimagine the library as a lever of development extends beyond the borders of industrialized countries, we are actively expanding our library programs within the Global South. After a year of successful experiments in 2015, our projects have developed rapidly in France. With LWB’s oversight and expertise, many communities have acquired the Ideas Box: Calais, Paris, Sarcelles, Marseille, and the Department of Ille-et-Vilaine. LWB also works directly with local neighborhood associations such as Acelem in Marseille. By the end of 2016, we will have 15 Ideas Box projects running in France serving under-resourced communities around the country. Following a successful summer program in the South Bronx, New York in 2015, our U.S. projects have grown steadily. The Detroit Mayor’s Office invited LWB to run an Ideas Box project of afterschool, weekend, and school holiday programming. In early 2017, we will launch a new mobile library program with the Oakland Public Library. LWB focuses its US programs on impoverished communities with low literacy rates and poor access to the internet, libraries, and other cultural resources. In partnership with the Queensland State Library, LWB implemented an Ideas Box program for isolated Torres Strait Islanders, more than 1000 km away from the closest town. Before the Ideas Box arrived, librarians served community needs by plane. The Ideas Box brings precious tools for education and the preservation of cultural heritage. A second Ideas Box is currently being implemented in another isolated Aboriginal community. In partnership with the Futur Au Present association, LWB has developed the Ideas Box as a cross-sectional response to problems related school drop-out, child labor, and life in the streets, especially in Casamance in the Ziguinchor region. The Ideas Box is delivered for the girls in the Maison de l’Education de FAP, as well as for the Accommodation Center for Children in the Street; it also serves primary schools in the neighborhoods and the public high-school of Ziguinchor. Beyond its focus on children’s education and protection, the project is also the best opportunity for new economic models: for instance, the Box is open in the evening to provide people in the city with Internet access and training. At this Ideas Box, folks can also pay to come watch football games together. Their financial contributions balance the project finances and make it sustainable. When one has lost everything, the one thing that cannot be taken away is the ability to dream.